Re|source is a virtual studio developed collaboratively by professional artists and participants. 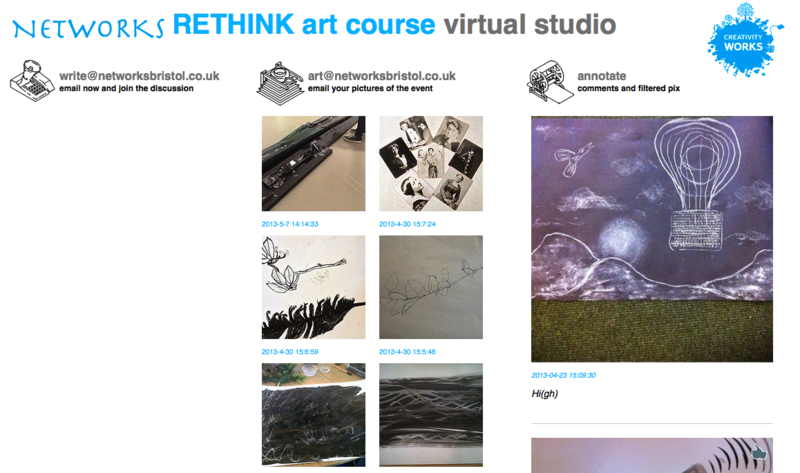 The studio provides online space for the sharing of images of artwork developed within a project and the opportunity to comment on that artwork by members of the group. Re|source is a unique approach to community arts development. Participants work alongside artists to develop their own practice and build projects around their distinct interests and skills. An IT Mediator works alongside the group and the artist to provide training and support. As a closed creative community, to upload images of their own and other artworks along with comments and ideas which build a visual narrative documenting their creative processes and progress. A chance to maintain contact with their group between weekly sessions. Later on, sharing their virtual studios with others to form a shared creative community. Finally, curating an on-line exhibition to share their artwork with the wider community. To see how Re|source was used within the Networks project click here. Re|source was further developed as a parallel blog space for artists, to capture the artist-facilitators reflection on their own creative practice during the project, as well as the participants’ development.